« Gardening Mishaps and Triumphs—Too bad we can’t live on sunflowers. 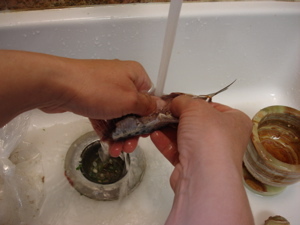 My recent post on cleaning squid became so popular, it was picked up by CBS-5 and, for the first time, people that don’t actually know me started reading my blog. 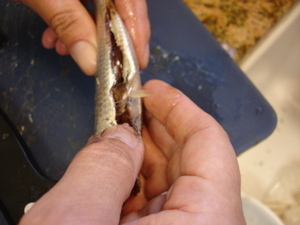 I guess there’s a call for that sort of thing, so now we’re going to learn how to clean sardines. Those of you who know me (if you’re still reading!) 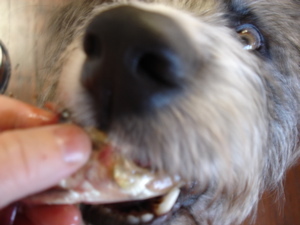 know that I love sardines more than practically any other food. These were gorgeous. I picked them up at Monterey Fish Market last weekend with not a thought of what I’d end up doing with them. What I did with them tasted like Spain, if I do say so myself. And it was really my dining partner who said it. She should know. She’s eaten sardines in Spain. 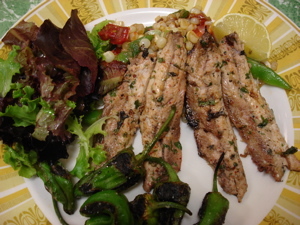 This was one of the best meals I have ever cooked and one of the simplest. 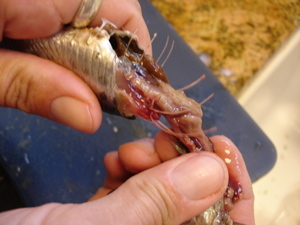 I’ll just say at the outset…if you were completely grossed out by the squid (and you and I both know who you are) you might not want to read any further. But, it’s a train wreck so I know you’ll look anyway. Here we go: Wheeee! First you must behead them. Just grasp it and pull toward the back. Most of the guts will come out with it. Discard head and guts. 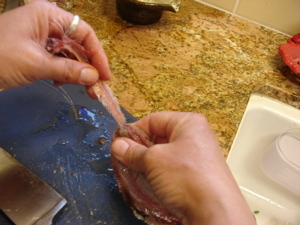 Grasp the top fin firmly and pull toward the back of the fish until the bone along the top comes out with it. 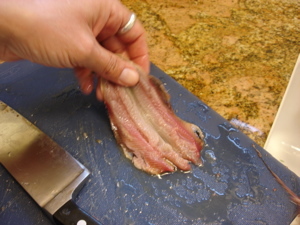 Run your fingers down the belly gently to open the fish all the way so it is flat. 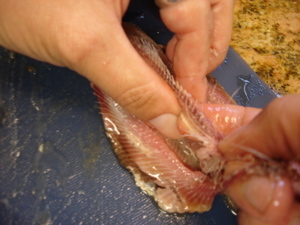 Gently lift the backbone up while sliding a finger underneath to make sure you don’t remove any of the flesh with the bone. 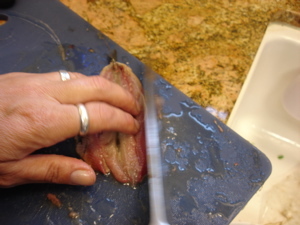 Pull the bone sharply to remove it and the tail. 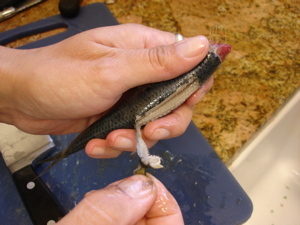 You must grasp the fish firmly while you’re doing this as the tail doesn’t want to come off. This isn’t necessary but I like to trim the edges a bit for a neater look. And this helps get rid of some tiny bones. Ok, here we go again. 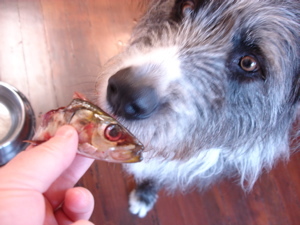 You know sardines are good for dogs. Lots of Omega-3s. This is one of our accompaniments. So simple! 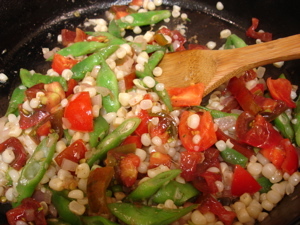 Green beans from the garden, corn, and tomatoes sauteed with onions in olive oil. 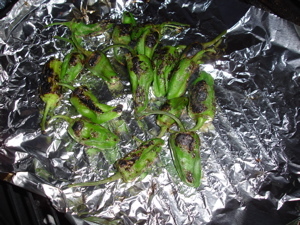 Grilled pimientos de Padron. Now these taste like Spain! All I did with the fish was marinate it with pounded garlic, parsley, salt, olive oil, lemon juice, a tiny bit of cumin, and some Pimenton de Espelette from the French Basque side. You could use Spanish paprika as well. We grilled them and that was it. Smoky and delicious! Great with rose. This entry was posted in healthy, seafood. Bookmark the permalink. Post a comment or leave a trackback: Trackback URL. Hi Star! thanks for reading. Haven’t seen you at the market lately…. 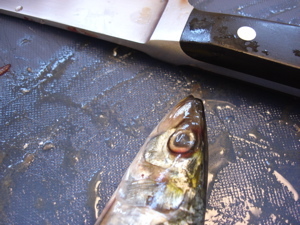 I guess there’s a call for that sort of thing, so now we’re going to learn how to clean sardines. where do u find the pimiento de’espelette salt? Also, gourmet and specialty stores. Good luck. Fab step by step instructions. So easy to follow with great results !! Yummy !! Many thanks.